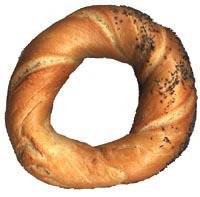 The Krakow snack of choice is obwarzanek, a palm-size twisted ring of bread strewn with poppy seed, sesame or salt. Street vendors sell the obwarzaneks all over the downtown area. Poland has its own versions of fast food and snacks well established in the country's culinary traditions. They are both cooked at home and served in cafeterias and diners often confusingly called 'bar' in Poland. The following are traditional Polish fast food still popular in Krakow despite deep inroads of pizzas and burgers. Originally, Polish bigos has been hunters’ favorite meal. The pork, beef, ham, sausage and sauerkraut stew is easy to cook over a bonfire, easy to keep, tastes the same or better when reheated, and warms you up right away. Ingredients notwithstanding, bigos tastes great when done properly, and now many Poles relish it as everyday dish. Pancakes are popular lunch in Poland. Here they tend to be even thinner, served rolled up after spreading with jam or flavored cottage cheese, or anything. Most probably tripe is not your idea for today’s lunch. But many Poles still relish a spicy dish of stewed tripe, best with liver dumplings and grated Parmesan. Another spicy stew, this one of beans and sausage. Of course, outlets of major multinational fast-food chains (you name them) flourish in Krakow, and Big Mac sells at two euro or so. There is also no shortage of mom-and-pop joints with hotdogs, hamburgers, pies, toasts, etc. Pizzas popularity with Krakow natives and visitors gave even rise to local mini-chains alongside multinationals’ franchisees and independent pizzerias. At the same time salad bars have won themselves numerous patrons, notably among students and young professionals. Numerous kebab stands, some outfitted with a couple of tables, has recently become probably the most noticeable fast food places in central Krakow. Fancy, quality hamburgers have become fashionable among young urban trendies in Krakow in recent years. Another, corresponding fad is a widespread penchant for street food, usually simple but sometimes relatively sophisticated, sold by stalls and from pushcarts. Recently, food trucks are apparently all the rage on the Krakow (side) streets. Sometimes they are actually restaurants on wheels with pavement annexes, serving fancy if simple means. Usually they are clustered at "food truck parks". Copyright © 2001-2018 MAREK STRZALA. All rights reserved.